Offers more granular control over how GPU horsepower is distributed (i.e. more cycles applied on the detailed areas of a scene and fewer on the less detailed areas) to increase performance and at the same image quality, or produce similar image quality with a 50% reduction in the time required to generate shaded pixels. More control over pixel shading rate; efficient for effects like motion blur and foveated shading. This capability enables shading and geometry samples to process at different rates for more efficient execution. Deliver faster than real-time performance for transcoding, video editing, and other encoding applications with a dedicated H.264 and HEVC encode engines and a dedicated decode engine that are independent of 3D/compute pipeline. Dramatically reduce visual aliasing artifacts or “jaggies” with up to 64x FSAA (128x with SLI Mode) for unparalleled image quality and highly realistic scenes. Support up to four 8K (7680 x 4320) monitors at 60 Hz, four 5K (5120 x 2880) displays at 60 Hz, or four 4K (3840 x 2160 or 4096 x 2160) displays at up to 120 Hz. Quadro RTX 4000 supports HDR over DisplayPort 1.4 (SMPTE 2084/2086. BT. 2020) with 4K at 60 Hz 10b/12b HEVC decode, 4K at 60 Hz 10b HEVC Encode. Three displays attach to the provided DP connectors, while the fourth utilizes the included USB Type-C to DP adapter. Get more Mosaic topology choices using high-resolution display devices with a 32K max desktop size. VirtualLink is an industry standard alternate mode of USB Type-C that delivers 4 display lanes of HBR3 DisplayPort, USB 3.1 Gen2 SuperSpeed data, and up to 27 W of power to next generation VR HMDs (Head Mounted Displays). Software framework that makes realtime ray tracing possible, portable, and presentable. Provides interoperability between rasterization, ray tracing, compute and AI/Deep Learning. New Turing ray tracing acceleration in OptiX, DXR and Vulkan. NVIDIA MDL, now open source, and support for Pixar’s Universal Scene Description (USD) promote portability and consistency. Provides a neural graphics framework for image processing. Brings AI-based features to end user applications to enhance graphics, photos, imaging, and video processing. NGX features utilize Tensor Cores to maximize performance and efficiency. Allows NVIDIA to bring advances in AI features to developers who place them into applications with NVIDIA pre-trained neutral networks. AI InPainting allows the removal of existing content from images and replaces it with realistic computer-generated alternatives. AI Up-Res increases the resolution of an image or video by 2x, 4x, or 8x using AI to create new pixels by interpreting the image and intelligently placing data in the new image. DLSS (Deep Learning Super Sampling) removes jagged lines to smooth them, producing a higher quality image than by using other techniques. AI Slow-Motion inserts interpolated frames into a video stream to provide smooth, slow-motion video. Deep learning frameworks such as Caffe2, MXNet, CNTK, TensorFlow, and others deliver dramatically faster training times and higher multi-node training performance. 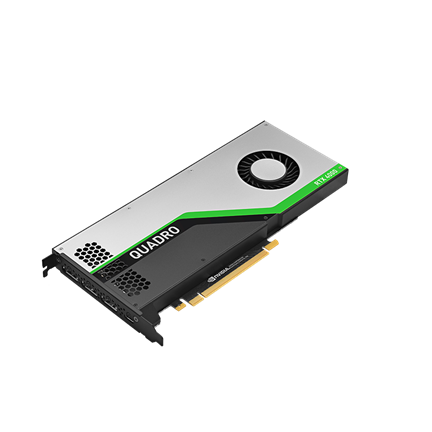 GPU accelerated libraries such as cuDNN, cuBLAS, and TensorRT deliver higher performance for both deep learning inference and High Performance Computing (HPC) applications. Natively execute standard programming languages like C/C++ and Fortran, and APIs such as CUDA, OpenCL, OpenACC and Direct Compute to accelerate techniques such as ray tracing, video and image processing, or finite element analysis or computational fluid dynamics (among others). DP-HDMI-THREE-PCK Connect the Quadro RTX 4000 to HDMI displays at resolutions up to 4K with PNY Part Number DP-HDMI-THREE-PCK. The three included DisplayPort to HDMI adapters are recommended by NVIDIA, provide outstanding image quality, and are built to professional standards. DP-HDMI-SINGLE-PCK Connect the Quadro RTX 4000 to an HDMI display at resolutions up to 4K with PNY Part Number DP-HDMI-SINGLE-PCK. The included DisplayPort to HDMI adapter is recommended by NVIDIA, provides outstanding image quality, and is built to professional standards.